The Good Times Blog: Is That a Gun in Your Diaper or Are You Just Happy To See Me? Is That a Gun in Your Diaper or Are You Just Happy To See Me? Howard "Bubba" Ludwig applied for an Illinois Gun Permit and was granted permission to own a 12-gauge Beretta shotgun. 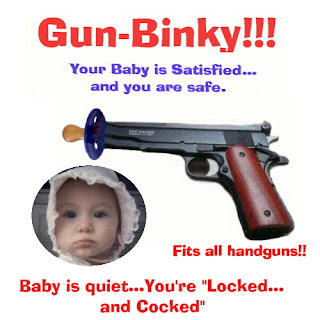 Since Bubba meets the State requirements for gun ownership, this is no surprise, but did I mention that Bubba is 10-months old? Bubba's father filled out the application for him after Bubba's grandfather gave him the Beretta as a gift. Not thinking he would actually get the permit, Howard Ludwig, Sr. listed the baby's correct height and weight (2 ft. 3 in, 20 lbs.) on the form and drew a squiggly line where the signature of the applicant should be. Turns out that Illinois doesn't have an age requirement for gun permits. Congratulations Bubba, you can now protect your home and family! Not sure what to make of this. Not sure at all. All I know is that our gun laws clearly make perfect sense and anyone who suggests we have a public debate on the issue is a dirty, evil, communist. It's so obvious! OF COURSE the framers of the Constitution were referring to infants when they drafted the Second Amendment! They're our most vulnerable citizens! If you'll excuse me, I'm going to go light myself on fire now. No the pre-born infants are our most valuable citizens, infants come in second. Basically, the further you get from being an embryo, the less valuable you are. Perhaps THIS Will Change Your Mind!